“Advancing digitalisation in the world of work is opening up new possibilities in the didactic and methodological design of dual vocational education and training in both companies and vocational schools. 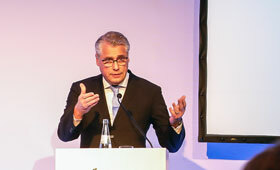 These possibilities offer a unique opportunity to give a desperately needed boost to the appeal of vocational education and training and it is essential that we take advantage of it.” This was emphasized by the President of the Federal Institute for Vocational Education and Training (BIBB), Friedrich Hubert Esser at the opening of a symposium which is taking place today and tomorrow in Leipzig. The BIBB and the Federal Ministry of Education and Research (BMBF) are jointly hosting the event entitled “VET 4.0 – Future opportunities as a result of digitalisation”. At the event, around 500 representatives from policy-making, business, academia and education and training practice will discuss the challenges and opportunities to be expected in the increasingly digitalised world of work of the 21st century. The BIBB president explains why: “Ultimately, the degree to which the challenges of digitalisation facing vocational education and training can be successfully overcome is dependent on the competence of company-based and school-based training personnel.” It is all about them. “If we are not successful in getting teachers and trainers on board and convincing them about the opportunities of digitalisation, then company-based and school-based training practice will not function effectively. Esser explains that the consequences of this transformation will also be changed work requirements in value-added chains and networks. “The vocational education and training system must respond to this—on the one hand we must strengthen company-based and vocational continuing education and training, while training and advanced training regulations must be adapted more quickly on the other.” In future these should include more key qualifications such as process or IT competencies which are growing in importance, adds Esser. Proof of these developments is provided by the joint BMBF/BIBB initiative “VET 4.0 - Skilled worker qualifications and competencies for the digitalised work of the future”, the interim conclusions of which will be presented at the conference in Leipzig. The goal of the joint BMBF/BIBB initiative is to identify the impacts of digitalisation on qualification requirements at an early stage across all sectors based on selected job descriptions. Where required, it derives recommendations for action for regulatory work as well as for the continuing education and training of trainers. Further information on the symposium in Leipzig and on the topic of VET 4.0 is available on the BIBB website at www.bibb.de/de/65876.php (in German only) or www.bibb.de/en/26729.php.